Breaking news: dad sneakers are not just for men with children anymore. They're all over the world of streetwear and on the feet of fashionistas everywhere. And then Puma said: "Same." Every once in while, inexplicable hype descends upon a seemingly random item and all matters of rational purchase decision-making goes out the window. It's the magic of virality. We're talking bulky, uncool (until now), kinda nerdy looking running shoes, typically in a light color scheme. Think Jerry Seinfeld in his prime. Pretty much every fashion brand has interpreted the trend, from sportswear companies like Fila, to contemporary leaders like Acne, to luxury maisons like Chanel. If you follow fashionistas on Insta, then you've already seen this fad flood your feed. They're the tiny sunglasses of footwear, aka everywhere (jury's still out on whether Kanye has prescribed them to Kim). And whether you're on board or categorically against them, dad sneakers are about to go from niche to mainstream, likely sticking around for another little while. What's ironic is that the trend was seemingly born out of irony, just like other cool kid trends of yore, such as normcore or fanny packs. To get a better sense of what we're dealing with here, we asked a bonafide sneaker expert (and previous DH blog contributor), Jesse Ingalls, to give us some insight. Jesse shoots content for Reebok and has a longstanding love affair with Nike, so he knows his stuff. "What I find so intriguing, especially with trends that originate in high fashion, is that the majority of them are conceived as satire," he explains. 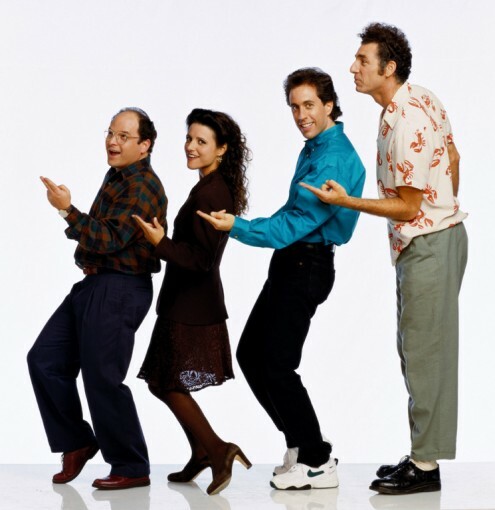 While it's impossible to really pinpoint how this trend crept its way out of dad's closet (Jerry Seinfeld could technically be at the root of it for all we know—fyi, he appears to favor the Nike Monarch, "Nike’s highest volume shoe and literally worn by dads," confirms Jesse), it has to be said that the sneaker world was all about a clunky shoe not that far back. "We were all wearing puffy skate shoes fifteen years ago," admits Jesse. But things have to evolve to stay fresh, and "now you see skaters in Converse, which are essentially the antithesis of chunky." Exactly how the dad shoe crept back into sneaker culture is not something we can pinpoint, but perhaps the influence of streetwear on high fashion would be a good place to start? Style influencer @tamirajarrel rocks some ultra girthy Balenciaga kicks. While luxury designer houses are having a field day with the dad shoe, actual sportswear companies are digging through their own archives to bring back some old school styles from retirement. "In my opinion, chunky dad shoes are best executed when you stick with the super classics," muses Jesse, "like the Nike Monarch [Jerry's choice, see above], the Adidas Ozweego (a new take by RAF on an old model), or something completely out of left field like the Osiris D3, a 15 year old skate shoe that recently reappeared on the feet of A$AP Rocky." The choices are plentiful at every price point, no doubt about it. And a classic player on the athletic footwear scene wanted in: Puma recently dropped the Puma Thunder Spectra, a colorful take on chunky dad sneakers. Pandemonium among sneaker aficionados ensued and the style sold out almost immediately. Surprising? Maybe a little bit. To tie things back to high fashion, the model is reportedly inspired by Puma's previous collaboration with the late great Alexander McQueen, and people are eagerly awaiting its restock. Full circle indeed. While using the hashtag #thunder for Instagram wasn't the best choice for the brand to be able to peep the flood of UGC it was surely anticipating—the tag is populated with over two million posts of, well, actual thunder—the user content came nonetheless. When a well-known brand drops a new product to enter an uncharted arena, people are going to pay attention. Lucky for Puma, the sneaker subculture is riddled with zealots who anticipate hot releases and who are willing to do what it takes to get their hands on them. Because the Puma Thunder Spectra dad sneakers seemed to be so hyped on Insta, we went into our AI-powered tool, Vision, to see the performance potential of all this user-generated content. We gathered a bundle of Thunder Spectra UGC inside a Vision Plan and noticed that the performance predictor graded every single image (but one) as a potential star performer—and the straggler was still predicted to be a good performer, natch. The Puma Thunder Spectra dad sneaker is turning out to be a huge win for the classic sports brand. Stellar street cred, social media hype, and on-trend focus: three ingredients that are working together in perfect harmony to create that elusive social viral moment. To learn more about Vision and trend performance, click the button to get in touch.